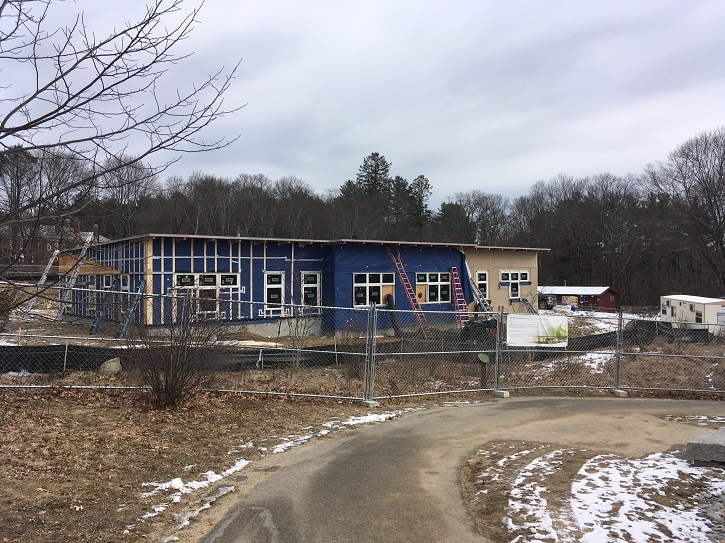 Posted on February 15, 2018 by Kelly M.
Progress on the Environmental Learning Center continues at a brisk pace even through the winter weather! 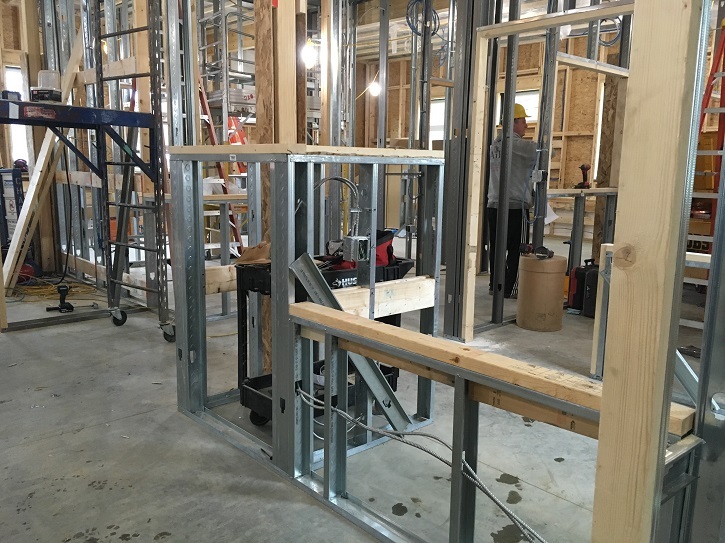 Work now has focused mostly on completing the building envelope and beginning interior construction. Here’s a peek at what happened during January. 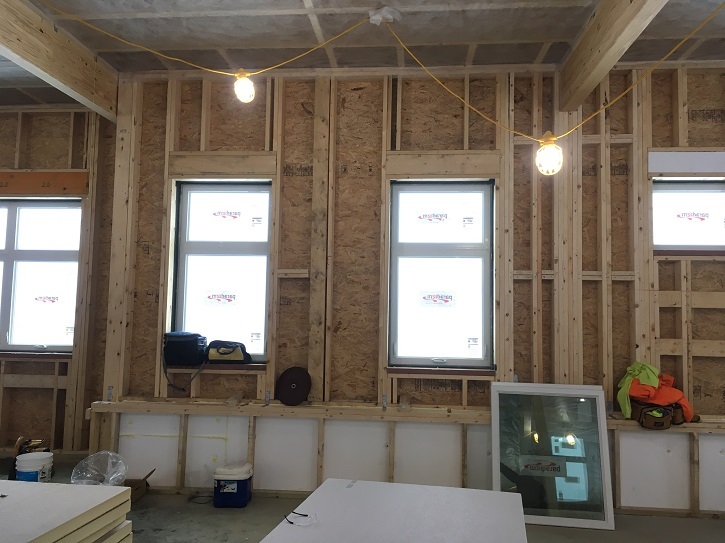 The month began with huge quantities of insulation going up on both the walls and roof to ensure the building uses as little energy as possible to heat and cool. 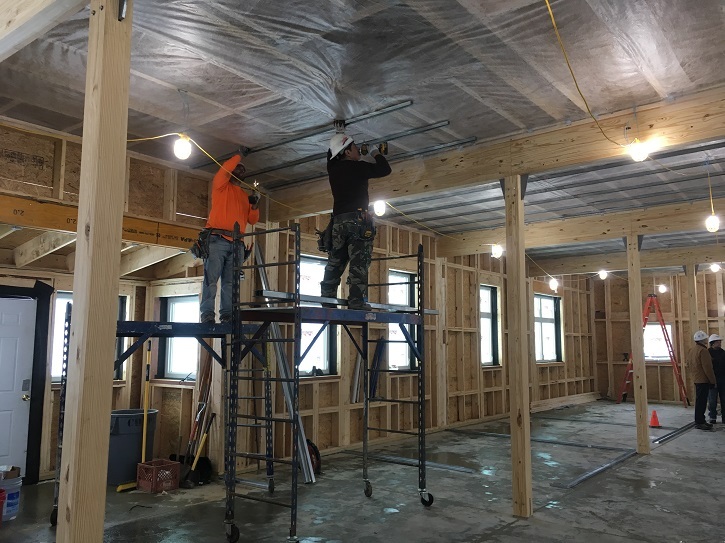 With 4” on the outside walls and 7” over our heads, we know that our staff will be warm in winter and cool in summer within this net-zero cocoon. The windows have all been installed now as well, with plenty of weather-stripping tape to eliminate all drafts. 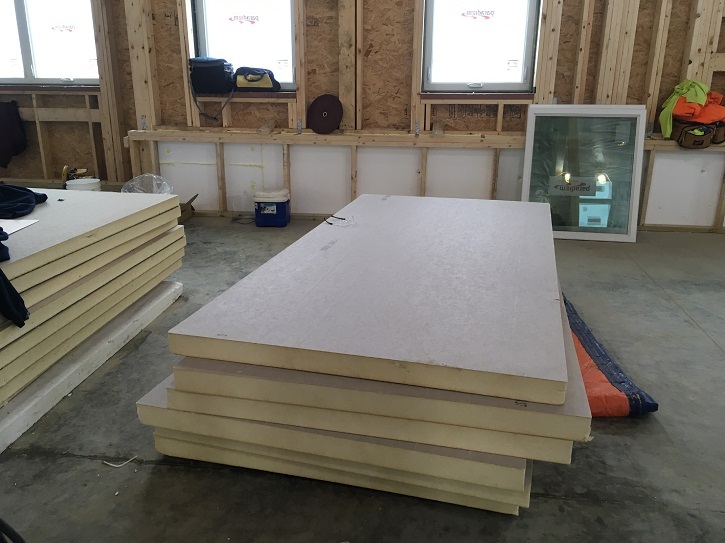 The building passed its “blower-door test” (which pressurizes the interior to measure leaking air) with flying colors, registering one of the highest scores our design team has ever seen on a project. From the outside, the building was temporarily colored in “Mass Audubon blue” as a vapor barrier was installed on all sides to allow the well-insulated structure to breathe properly. This blue will be covered by cedar and metal siding, but we will always know our Mass Audubon roots are there. With the building nicely sealed, attention turned to the interior as the ceilings and walls took shape. 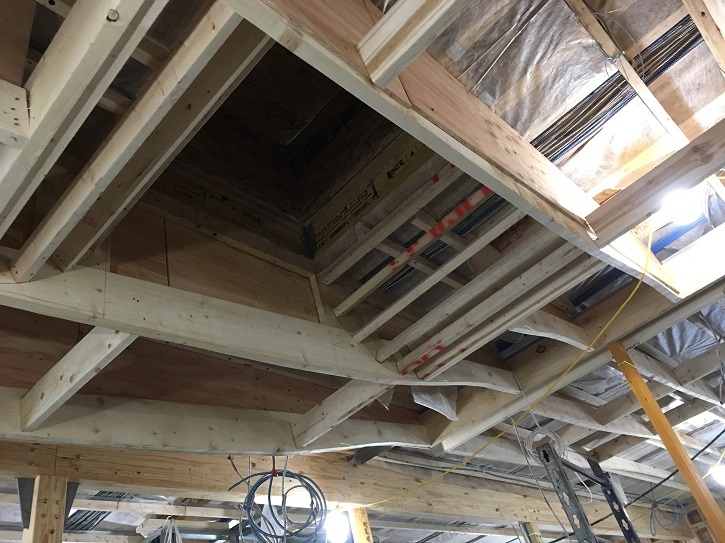 Plastic sheeting over the ceiling joists will hold blown-in cellulose for even more insulation and also noise reduction. The interior spaces are also now coming to life, and we can see the working spaces for our staff emerge. One fun feature is the custom housing for aquarium tanks in the welcome area, greeting school teachers and camp parents with a wildlife display as they check in for their programs. 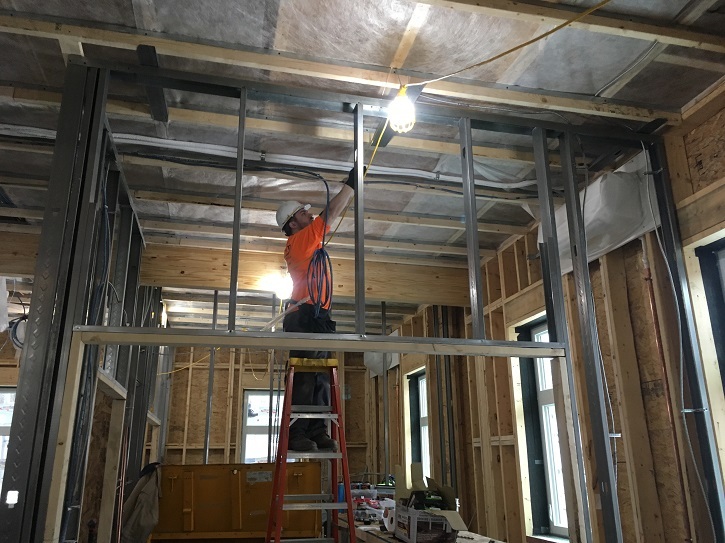 Up above, our crew foreman Bob worked long hours to get the curve of the ceiling just right as it ascends from the front door, past a skylight, and into the great room. We hope the rising arc of the ceiling reminds people of a swooping bird or racing clouds overhead. Next up has been the electrical and network wiring, miles and miles of cables and fiber to keep us all working hard in the 21st century! 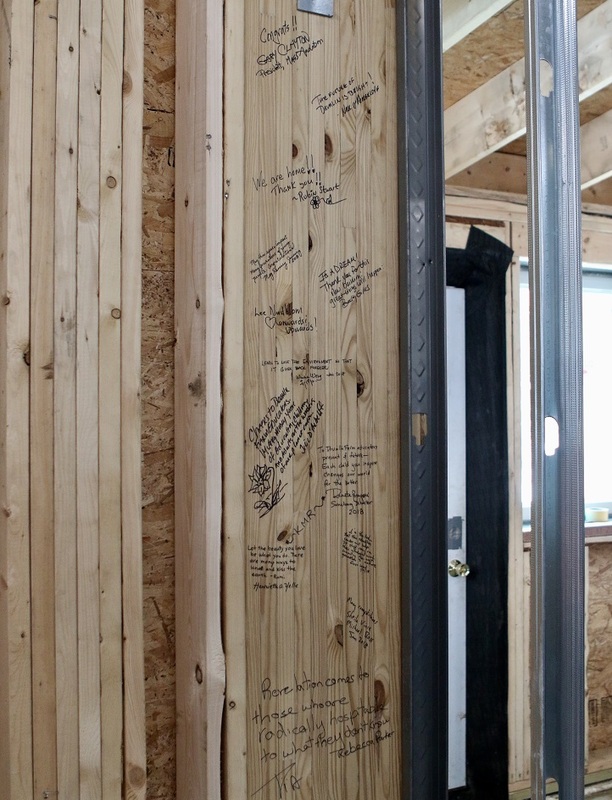 January came to a close with a special milestone: a “beam signing” day where Drumlin Farm staff and friends could leave their names and a special message for future inhabitants and visitors to the building. We were inspired by the well-wishes that will be hiding behind the walls to guide our work, and maybe someday be uncovered by future generations. 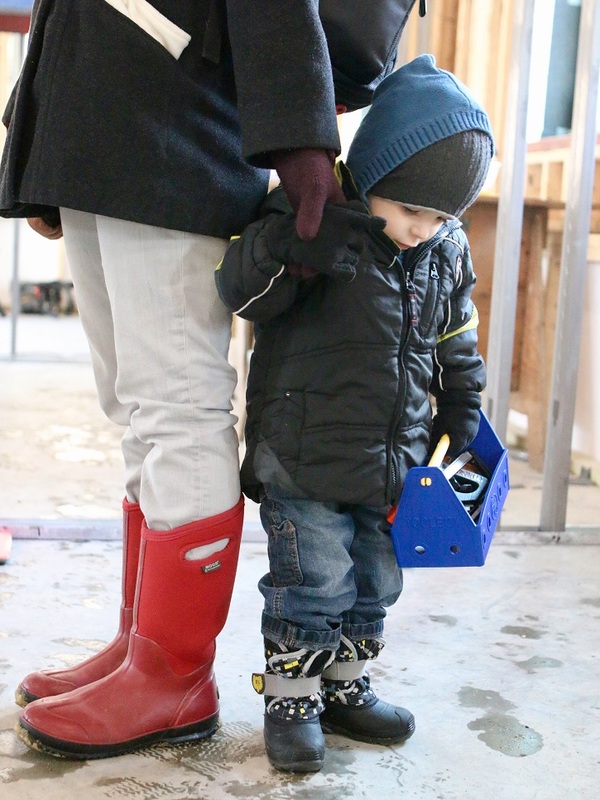 The event was also a chance for our staff to get a glimpse inside the hard hat area and imagine how this project will change not just the physical space where they work, but how they will be able to collaborate and connect with the people who come here. We are excited to think of how a Drumlin Farm experience can shape the future of our world. Look for more updates coming soon. If you would like to learn more about the project, or get involved yourself, we invite you to learn more here. This entry was posted in Uncategorized and tagged building, construction, drumlin farm, ELC, Environmental Learning Center, net-zero, sustainable building on February 15, 2018 by Kelly M..